Quick Look is the file preview app that most Mac OS X users would be familiar with. It let’s you see the highlight and gives a visual snapshot of the content contained in files by giving a glimpse of what’s in the file or folder. Every operating system be it a mobile platform like Android or iOS, or PC platform like Linus, Mac OS X or Windows, all have special features unique to that particular OS. Sometimes companies copyright features that they think would differentiate them from the rest and give them the competitive advantage over others in the market. Quick Look on Mac OS X is one such feature which you won’t see on Windows 10 or any other Windows PC version for that matter, but there is a way you can utilize a similar type third-party file preview tool that performs exact same functions as Quick Look does on Apple devices, it’s called Seer. With Seer for Windows 10 you can see main summary of what’s inside file/folder in a separate small window without wasting time on opening and searching every file individually. What’s more you can Download Seer for free and it works on Windows 10/8/8.1/7/Vista, older Windows versions are not supported. After installing Seer file preview app Windows PC/laptop users can take advantage of this little utility app to get more work done in less time. Main aim of this app is to free users from the time consuming process of first opening files and folders to see their content, and makes it quicker to jump from one file to another by seeing its content without having to open them first. Especially on slower PCs, opening files and folders takes time, so if you are looking for a video, music file, text document on PC but are not sure about its content use this app to see highlights and move on to the next one. Just select the file and hit space key to open the window that displays content summary of the file in an orderly layout. Seer Quick Look for Windows has quick preview feature that supports text, audio and video file formats. Reviews suggest that Seer for Windows PC even outperforms Apple’s Quick Look in many aspects; its audio and video file searching is extremely efficient. Instead of opening a video file via a media player app to see what is inside it, simply drag mouse pointer to it to highlight the file and hit space key to see a pop-up window with file name, video title, length, format and screenshot of the clip. 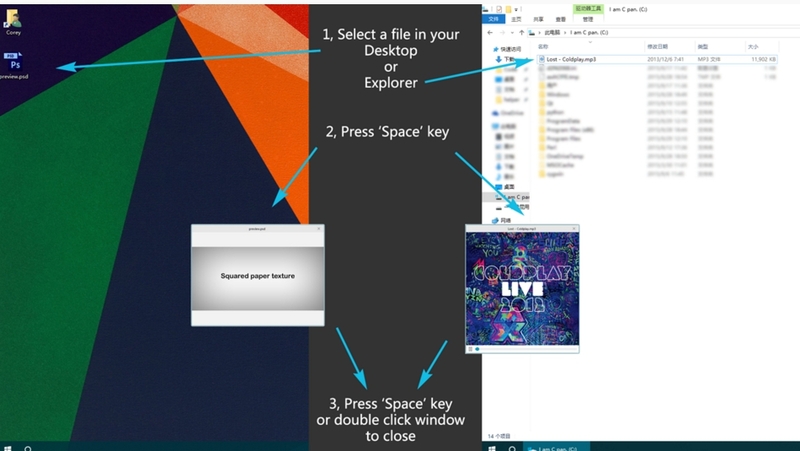 Open Windows File Explorer Options (press Win+S keys) and click on the search box and type ‘file explorer options’ in it. Click the View tab on File Explorer Options window. After following the above mentioned method Seer should show screenshots of video and audio files without errors. Download file needs only 24MB space on disk. If security is of prime concern then from Seer settings you can disable internet access. Send comments if you need any assistance.